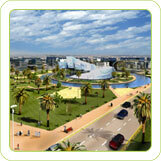 Energy City Qatar (ECQ) is the first ever integrated energy hub in the GCC and MENA regions. The purpose of ECQ is to enhance the Gulf region’s ability to capture critical revenue streams from hydrocarbons and act as a nucleus for the core elements of Middle East ever growing oil and gas industry. ECQ is located midway between the Dafna business/residential district and the Lusail development district on the east coast of Qatar, approximately 20km north of Doha International Airport. The site is connected to the wider Lusail development via the Al Khor expressway. ECQ was launched in March 2006 with an estimated project value of US$2.6 billion. It is divided into 2 phases. The first phase, ECQ 1 will house corporate offices and other business related infrastructure whilst the second phase, ECQ 2 will provide residential facilities to corporate members utilizing the ECQ1 facilities. ECQ 2 however, has been sold to a private entity. ECQ 1 will consist 92 corporate buildings, able to house approximately 20,000 people. The land plot extends to a total area approximately 721,584 sq m and the site topography is generally flat. All buildings have to adhere to the building guidelines defined by ECQ. Structures will be constructed at the highest standards complying with US Green Building Council LEED Certification requirements for energy efficiency. ECQ is an ambitious undertaking which aims to build a full-service city catering to every commercial, technical and human resource need of the oil and gas industry in the Gulf region. Aside from the vast state-of-the-art office facilities for the global oil, gas, service and infrastructure industries, it will have a world class geophysical data interpretation and storage centre, an advance training centre as well as modern communications and media facilities. As the world’s first integrated business centre, ECQ will be an international showcase for the next generation of technology and Innovations. It promises to play a major role in economic and social development of this region of the world.